Looking at our recently-concluded icehouse-2 development timeframe, we landed far less features and bugfixes than we wanted and expected. That created concerns about us losing our velocity, so I run a little analysis to confirm or deny that feeling. The first milestone baseline again gives a 10% expected growth, which means the target was 715 bugs… but we “only” fixed 650 bugs (like in havana-2). So on the bugfixes front, we are at 91% of the expected result. Considering the -1 milestones gives an expected growth in commits between grizzly and icehouse of +31%. Icehouse-2 is at 66% of expected result. So not good but not catastrophic either. What about cinder ? Now that’s interesting… Expected cinder growth between grizzly and icehouse is +103%. Icehouse-2 scores at 108% of the expected, grizzly-based result. Here we expect 2% less commits, so based on grizzly-2 we should have had 37 commits… icehouse-2 here is at 240% ! In summary, while it is quite obvious that we delivered far less than we wanted to, due to the holidays and the recent gate issues, from a velocity perspective icehouse-2 is far from being disastrous if you compare it to the last development cycle where the holidays happened at the same time in the cycle. Smaller projects in particular have handled that period significantly better than last year. We just need to integrate the fact that the October – April cycle includes a holiday period that will reduce our velocity… and lower our expectations as a result. Every year, free and open source developers from all over Europe and beyond converge in cold Brussels for a week-end of talks, hacking and beer. OpenStack will be present ! Marc Cluet will look into autoscaling using Heat and Ceilometer as examples. Balaji Padnala will present NFV and how to deploy it using OpenStack and OpenFlow Controller. Federico Simoncelli will cover integration between oVirt and Glance/Cinder for storage needs. I will go through a practical introduction to OpenStack development and explain why you should contribute if you haven’t already. Rob Clark will explore this class of interesting vulnerabilities from an OpenStack perspective. Gilad Chaplik will present how oVirt could reuse OpenStack Nova scheduling concepts. Me again, in a technical exploration on the OpenStack gating system and its unique challenges. Join Assaf Muller for an architectural, developer oriented overview of (GRE and VXLAN) tunnels in OpenStack Networking. Mike Kolesnik will look into integration opportunities between oVirt and OpenStack Neutron. Dirk Diane Mueller will give us an update on cross-community collaboration between OpenStack, Solum, Docker and OpenShift. Dave Neary should explain how to mix OpenStack with oVirt, OpenShift and Gluster to build a complete private cloud. We’ll also have a booth manned by OpenStack community volunteers ! I hope to see you all there. Just back from an amazing week at the OpenStack Summit in Hong-Kong, I would like to share a number of discussions we had (mainly on the release management track) and mention a few things I learned there. First of all, Hong-Kong is a unique city. Skyscrapers built on vertiginous slopes, crazy population density, awesome restaurants, shops everywhere… Everything is clean and convenient (think: Octopus cards), even as it grows extremely fast. Everyone should go there at least one time in their lives ! On the Icehouse Design Summit side, the collaboration magic happened again. I should be used to it by now, but it is still amazing to build this level playing field for open design, fill it with smart people and see them make so much progress over 4 days. We can still improve, though: for example I’ll make sure we get whiteboards in every room for the next time :). As was mentioned in the feedback session, we are considering staggering the design summit and the conference (to let technical people participate to the latter), set time aside to discuss cross-project issues, and set up per-project space so that collaboration can continue even if there is no scheduled “session” going on. I have been mostly involved in release management sessions. We discussed the Icehouse release schedule, with a proposed release date of April 17, and the possibility to have a pre-designated “off” week between release and the J design summit. We discussed changes in the format of the weekly project/release status meeting, where we should move per-project status updates off-meeting to be able to focus on cross-project issues instead. During this cycle we should also work on streamlining library release announcements. For stable branch maintenance, we decided to officially drop support for version n-2 by feature freeze (rather than at release time), which reflects more accurately what ended up being done during the past cycles. The security support is now aligned to stable branch support, which should make sure the vulnerability management team (VMT) doesn’t end up having to maintain old stable branches that are already abandoned by the stable branch maintainers. Finally, the VMT should review the projects from all official programs to come up with a clear list of what projects are actually security-supported and which aren’t. Apart from the release management program, I’m involved in two pet projects: Rootwrap and StoryBoard. Rootwrap should be split from the oslo-incubator into its own package early in the Icehouse cycle, and its usage in Nova, Cinder and Neutron should be reviewed to result in incremental strengthening. StoryBoard (our next-generation task tracker) generated a lot of interest at the summit, I expect a lot of progress will be made in the near future. Its architecture might be overhauled from the current POC, so stay tuned. Finally, it was great meeting everyone again. Our PTLs and Technical Committee members are a bunch of awesome folks, this open source project is in great hands. More generally, it seems that we not only designed a new way of building software, we also created a network of individuals and companies interested in that kind of open collaboration. That network explains why it is so easy for people to jump from one company to another, while continuing to do the exact same work for the OpenStack project itself. And for developers, I think it’s a great place to be in: if you haven’t already, you should definitely consider joining us. When we changed the Technical Committee membership model to an all-directly-elected model a few months ago, we proposed we would enable detailed ballot reporting in order to be able to test alternative algorithms and run various analysis over the data set. As an official for this election, here is my analysis of the results, hoping it will help in the current discussion on a potential evolution of the Foundation individual members voting system. In the OpenStack technical elections, we always used the Condorcet method (with the Schulze completion method), as implemented by Cornell’s CIVS public voting system. In a Condorcet vote, you rank your choices in order of preference (it’s OK to rank multiple choices at the same level). 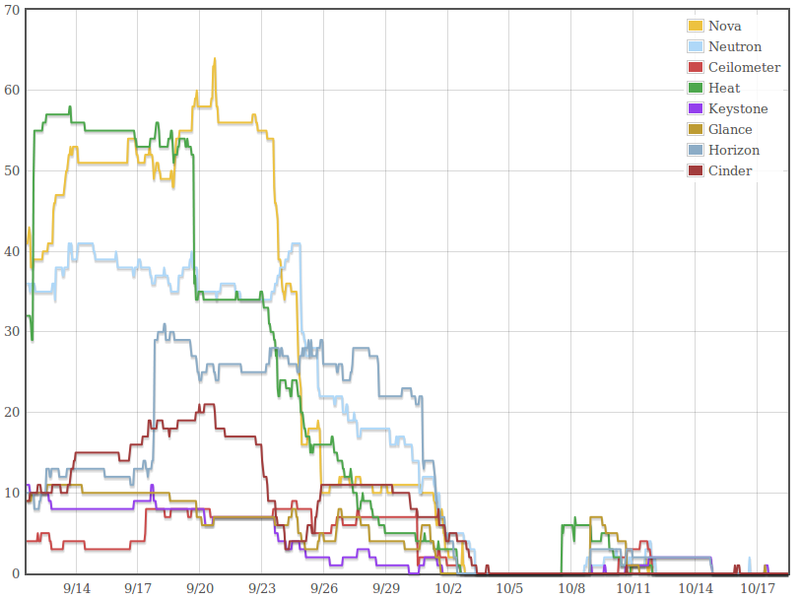 To calculate the results, you simulate 1:1 contests between all candidates in the set. If someone wins all such contests, he is the Condorcet winner for the set. The completion method is used to determine the winner when there is no clear Condorcet winner. Most completion methods can result in ties, which then need to be broken in a fair way. On that graph the bubbles on the left represent the number of high rankings for a given candidate (bubbles on the right represent low rankings). 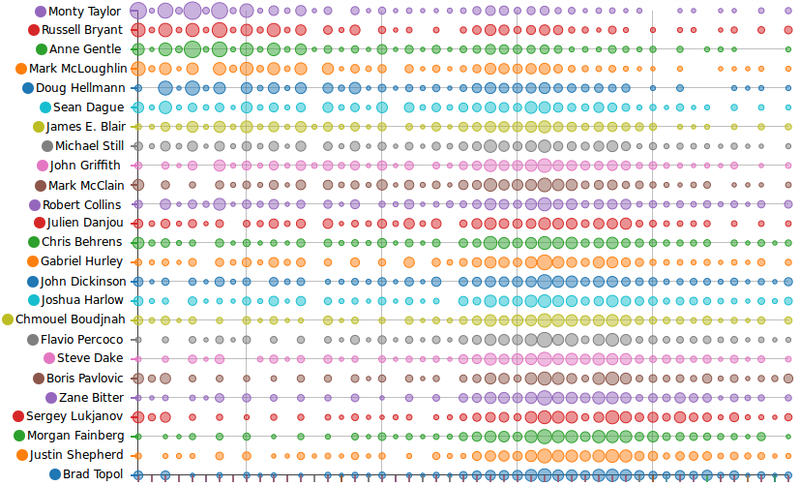 When multiple candidates are given the same rank, we average their ranking (that explains all those large bubbles in the middle of the spectrum). A loved-or-hated candidate would have large bubbles at each end of the spectrum, while a consensus candidate would not. Looking at the graph we can see how Condorcet favors consensus candidates (Doug Hellmann, James E. Blair, John Griffith) over less-consensual ones (Chris Behrens, Sergey Lukjanov, Boris Pavlovic). Condorcet indeed favors consensus candidates (and “natural” 1:1 election winners). It is not designed to represent factions in a proportional way, like STV is. There is an experimental proportional representation option in CIVS software though, and after some ballot conversion we can run the same ballots and see what it would give. I set up a test election and the results are here. The winning 11 would have included Sergey Lukjanov instead of John Griffith, giving representation to a less-consensual candidate. That happens even if a clear majority of voters prefers John to Sergey (John defeats Sergey in the 1:1 Condorcet comparison by 154-76). It’s not better or worse, it’s just different… We’ll probably have a discussion at the Technical Committee to see whether we should enable this experimental variant, or if we prefer to test it over a few more elections. Another analysis we can run is to determine if there was any corporate-driven voting. We can look at the ballots and see how many of the ballots consistently placed all the candidates from a given company above any other candidate. 7.8% of ballots placed the 2 Mirantis candidates above any other. 5.2% placed the 2 IBM candidates above any other. At the other end of the spectrum, 0.8% of ballots placed all 5 Red Hat candidates above any other, and 1.1% of the ballots placed all 4 Rackspace candidates above any other. We can conclude that partisan voting was limited, and that Condorcet’s preference for consensus candidates further limited its impact. STV is another ranked-choice election method, which favors proportional representation. Like the “proportional representation” CIVS option described above, it may result in natural Condorcet winners to lose against more factional candidates. I would have loved to run the same ballots through STV and compare the results. Unfortunately STV requires strict ranking of candidates in an order of preference. I tried converting the ballots and randomly breaking similar rankings, but the end results vary extremely depending on that randomness, so we can’t really analyze the results in any useful way. Run your own analysis ! That’s it for me, but you can run your own analysis by playing with the CSV ballot file yourself ! Download it here, and share the results of your analysis if you find anything interesting ! Yesterday, as the final conclusion of the 6-month “Havana” development cycle, we released the latest version of OpenStack, the 2013.2 version. It’s now composed of 9 integrated components, which saw the completion of more than 400 feature blueprints and the fixing of more than 3000 reported bugs. Personally I think we were a bit late, with RC1s globally landing around October 3 and RC2s still being published around October 15. I prefer when we can switch to “respin only for major regressions and upgrade issues” mode at least a week before final release, not two days before final release. 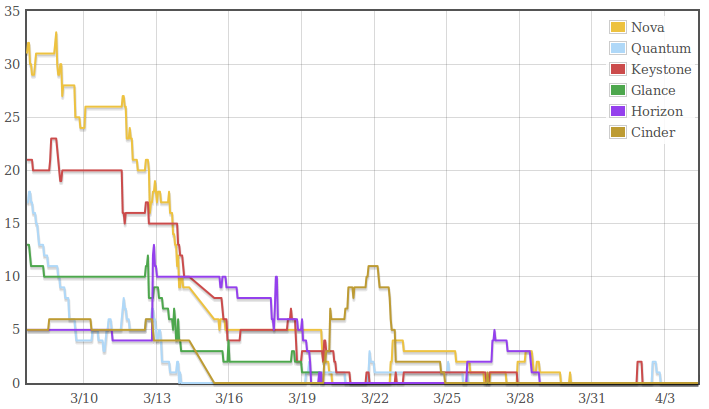 Looking at the graph, we can see where we failed: it took us 11 days to get a grip on the RC bug count (either by fixing the right issues, or by stopping adding new ones, or by refining the list and dropping non-critical stuff). Part of this delay is due to stress recovery after a rather eventful feature freeze. Part of it is lack of prioritization and focus on the right bugs. The rest of the graph pretty much looks like the Grizzly one. We were just at least one week too late. We’ll explore ways to improve on that during the Icehouse Design Summit in Hong-Kong. One solution might be to add a week between feature freeze and final release. Another solution would be to filter what gets targeted to the last milestone to reduce the amount of features that land late in the cycle, to reduce FeatureFreeze trauma. If you want to be part of the discussion, join us all in Hong-Kong in 18 days !